Why does the Trump administration suddenly care so much about Venezuela? 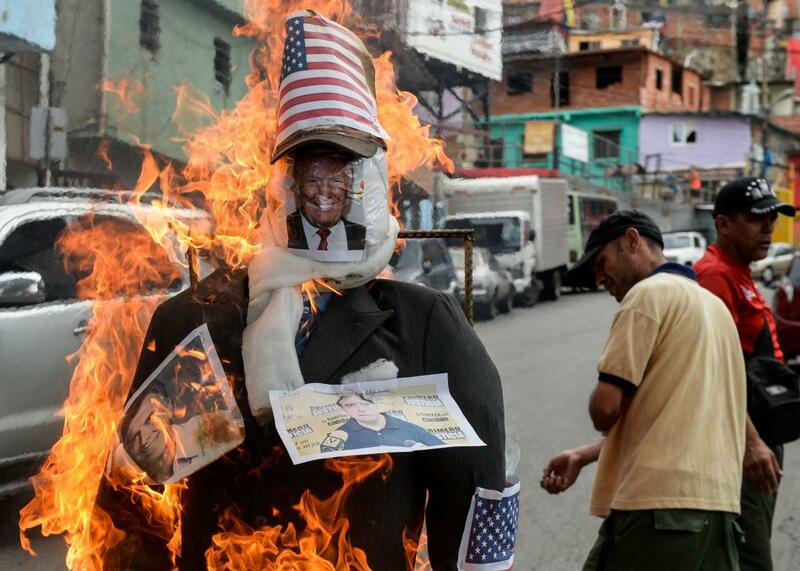 A dummy of US President Donald Trump is burnt in the ‘Burning of Judas’, during an Easter celebration, at 23 de Enero shantytown in Caracas on April 16, 2017. Here’s a telling omen: Under orders from Secretary of State Rex Tillerson, the State Department is reportedly drafting a new mission statement for itself. According to Josh Rogin of the Washington Post, the drafts are nearly identical to the current mission statement, except that they remove any mention of building a “democratic world” as a U.S. foreign policy goal. This isn’t exactly surprising. Tillerson has previously told his staff that “pressuring countries on democracy and human rights creates obstacles to our ability to advance our national security interests, our economic interests,” and he’s not the only one in the administration that feels that way. President Trump said in his inaugural address that “we do not seek to impose our way of life on anyone” and told an audience in Saudi Arabia in May, “We are not here to lecture.” These are understatements: Trump hasn’t just avoided lecturing autocratic governments; more often than not, he’s celebrated them. Most famously, of course, there’s the president’s controversial relationship with Russia’s Vladimir Putin. Trump has congratulated Philippines President Rodrigo Duterte, whose government has sanctioned the extrajudicial killing of thousands of drug dealers, for doing an “unbelievable job on the drug problem.” He says Egyptian strongman Abdel Fattah al-Sisi has “done a tremendous job.” He called to personally congratulate Turkish President Recep Tayyip Erdogan after a controversial constitutional referendum that most other Western governments denounced as an authoritarian power grab. Notwithstanding their differences on issues like trade and North Korea, Trump called Chinese President Xi Jinping a “good man” who “loves China” just hours after the death of imprisoned Nobel Peace Prize laureate Liu Xiaobo. And yet, the past week has seen the Trump administration take a surprisingly strong stance in condemning Venezuelan President Nicolas Maduro’s government, following the disputed election of a new assembly to rewrite the Constitution and cement his control over the increasingly volatile and economically distressed South American country. The U.S. had already sanctioned several Venezuelan officials in the lead-up to last weekend’s vote and afterward targeted Maduro himself with sanctions—an unusual step for a head of state that puts the Venezuelan president in the same category as leaders like Kim Jong-un, Bashar al-Assad, and Robert Mugabe. The White House has put out statements from Trump—which make almost comically little effort to match his rhetorical style—affirming that the United States “stands with the people of Venezuela in their quest to restore their country to a full and prosperous democracy.” When opposition leaders Leopoldo Lopez and Antonio Ledezma were jailed after the election, Trump said he held Maduro “personally responsible for [their] health and safety.” The U.S. is reportedly considering further sanctions, including on Venezuela’s vital oil industry. For anyone who’s been following the Trump administration’s foreign policy, the sudden concern for democracy and the rule of law is a little jarring, and the inconsistency has been widely noted. On Monday, National Security Advisor H.R. McMaster struggled to respond to a reporter’s question about what made Maduro’s power grab notably worse than the referendum that Trump had praised Erdogan for. This, too, felt like an odd fit. Whatever else Trump is, he’s never seemed like much of a Cold Warrior. During his campaign he had said that while he felt he could have gotten a better Cuba deal than Obama, 50 years of embargo was enough and “the concept of opening with Cuba is fine.” But by the end of his campaign, Trump had morphed into a Cuba hardliner as he sought—successfully as it turned out—to win Cuban-American votes in Florida. Florida also has a rapidly growing community of Venezuelans, many of them middle class exiles. The community certainly doesn’t yet have the same political clout as Cuban-Americans, but many of the staunchest Cuba hardliners in Congress, Florida politicians like Sen. Marco Rubio and Rep. Ileana Ros-Lehtinen, are also highly engaged on Venezuela. This seems just a little too neat. It’s also possible Trump’s team just figures it has little to lose from keeping the Congressional Cuba Caucus happy by punishing a Venezuelan government that, in addition to democracy issues, has suspected links to drug trafficking and is allied with Cuba and Iran. Given the importance of Maduro’s anti-Yankee bona fides to his appeal, he’s probably never going to be a U.S. ally, and there’s little to gain from trying to win his favor. For a president who views foreign policy in purely zero-sum transactional terms, a friendship with Venezuela has little to offer. This may also be one of the few occasions where the Trump administration is on the same page as most Latin American governments, which are mostly united in condemning Maduro’s power grab. There are risks, if the situation continues to escalate, though. One of the steps under consideration—and as Oppenheimer notes, being pushed by Rubio—is sanctions on the Venezuelan oil industry, the country’s main source of hard currency. This would be a substantial escalation beyond targeted sanctions on Venezuelan officials and would likely have a devastating impact on the country’s already teetering economy. The Maduro government will continue to blame Yankee imperialism for Venezuela’s unrest no matter what happens, but its case will be strengthened—and the opposition’s weakened—if U.S. policies are hurting ordinary Venezuelans. Support from other governments like Brazil and Mexico, always wary of U.S. interference in the hemisphere, could evaporate quickly. Another factor, of perhaps greater importance to Trump, is that despite all the tensions, Venezuela accounts for 10 percent of U.S. oil imports. A trade embargo could raise gas prices for Americans, a risk that Trump must be very loath to accept. So far, the strong U.S. response to Venezuela’s crisis, while out of step with his foreign policy, has been a low-risk way for the Trump administration to please some key constituencies and punish an anti-American government. But there are probably limits to how far Trump is willing to take that gamble.